to this page, if/when I re-visit it. The title above specifies 'Notes' rather than 'Guide'. 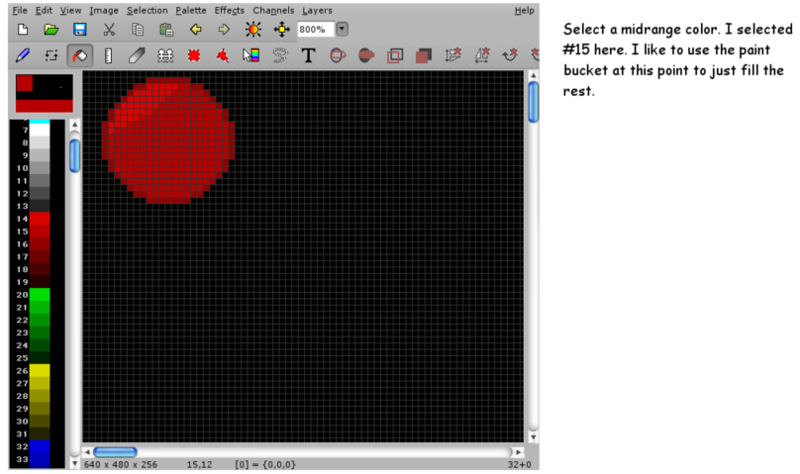 Initially, this page is meant as a collection place for notes on using mtPaint. So initially, this page is 'Notes', NOT a 'Guide'. In a magazine review of 'mtPaint' in the 2009-2010 time frame, the author mentioned having a problem with how to cut-or-copy and paste (a portion of an image). I too had this problem. 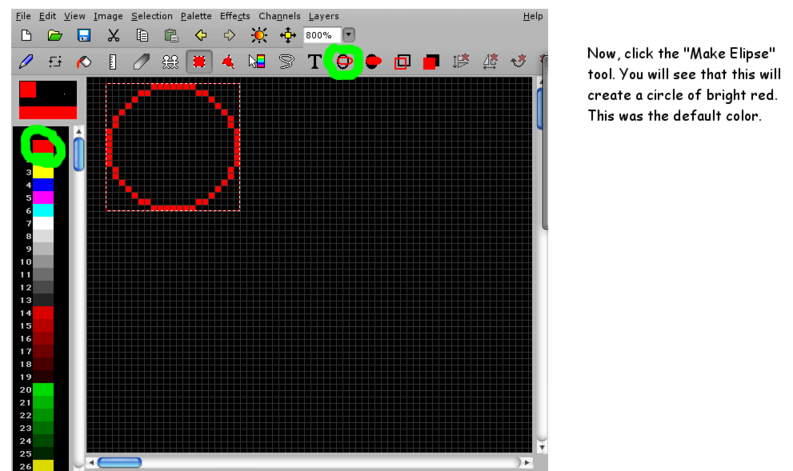 I finally found, via persistent web searching, a forum note that explains how cut-and-paste works in 'mtPaint'. The technique is really quite simple and powerful and well-implemented --- it's just that it is not intuitively obvious --- and it differs from the way Paste works in similar light-weight image editor programs, such as 'Irfanview' for MS Windows. The 'mtPaint' Paste technique is the topic of one of the notes below. As mentioned in that note below, an apparent documenter of 'mtPaint' ('wjaguar' = Dmitry Groshev, who is also a maintainer) admits (in 2006) that this was an oversight in the 'mtPaint' documentation. 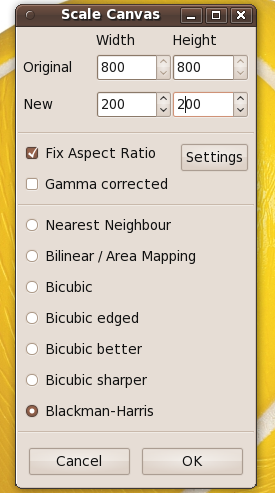 The only way a person could deduce how cut-and-paste works, from the documentation, is from one line in the 'Appendix' on 'Keyboard Shortcuts', where it mentions that the Enter/Return key is the shortcut for Paste --- or, more precisely, the shortcut for committing a Paste, after you have positioned an image segment where you want it. an image editor that hardly ever crashes or locks up. 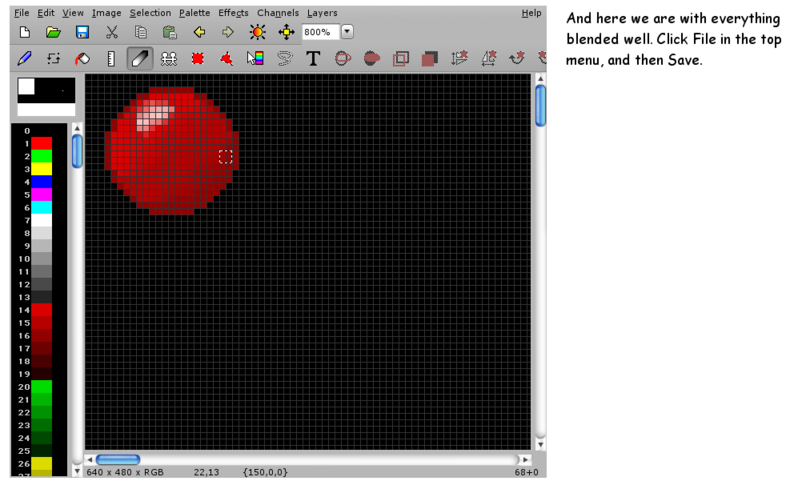 'mtPaint' also has 'layer' features and other features that I have not needed to try yet (in 2009-2010). So these notes do not initially deal with 'layers' and other 'exotic' features, and hence, initially, these are 'Notes', NOT a 'Guide'. 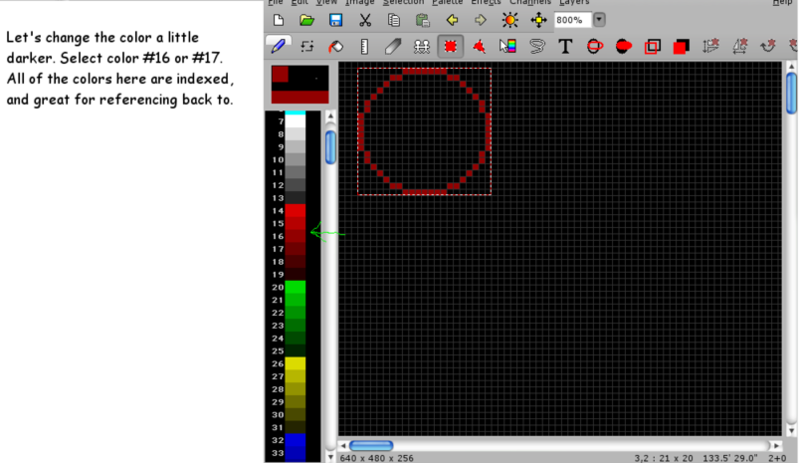 UPDATE: Around 2011-2012, I was trying a 'layer' option in 'mtpaint' and found that I was locked out of restarting 'mtpaint' by an error condition. I eventually found the problem was a corrupted '.mtpaint' config file in the home directory. Simply deleting/renaming that file and allowing 'mtpaint' to re-create it got me out of that jam. Since then, I have not tried using layers, and have had no real need to. Perhaps Groshev or some other maintainer will fix this in a future release. I find it amazing (in 2009 and 2010) that there is so much written about GIMP in magazine articles, reviews, forums, etc. --- and almost nothing is written about 'mtPaint'. It is almost impossible to find a 'tutorial' on even a small 'mtPaint' project --- such as crop, resize, or copy-paste --- on the Internet in 2010. And yet 'mtPaint' does almost all the basics that your 'average joe' would need for image editing. So this is my attempt to start helping document 'mtPaint' a little more, if only for myself, to remind myself how to do things after I am away from the software for a while. This page will be a place to collect my notes (and screenshots) while using 'mtPaint'. In addition to notes, I may occasionally add links to web pages that provide useful info on 'mtPaint' --- especially info that fills in 'holes' in the built-in mtPaint documentation (the 'handbook'). For convenience (easy reference), a 'local' link to an English version of the mtPaint documentation (the 'handbook') is in the Table of Contents section below. And, if I can ever find any, I may provide links to tutorials on 'mtPaint' --- preferably links that look like they won't go dead in the next year or two. The original author of 'mtpaint', Mark Tyler, has gone on to other programming projects, and Dmitry Groshev (mentioned above) took over as maintainer, circa 2008. 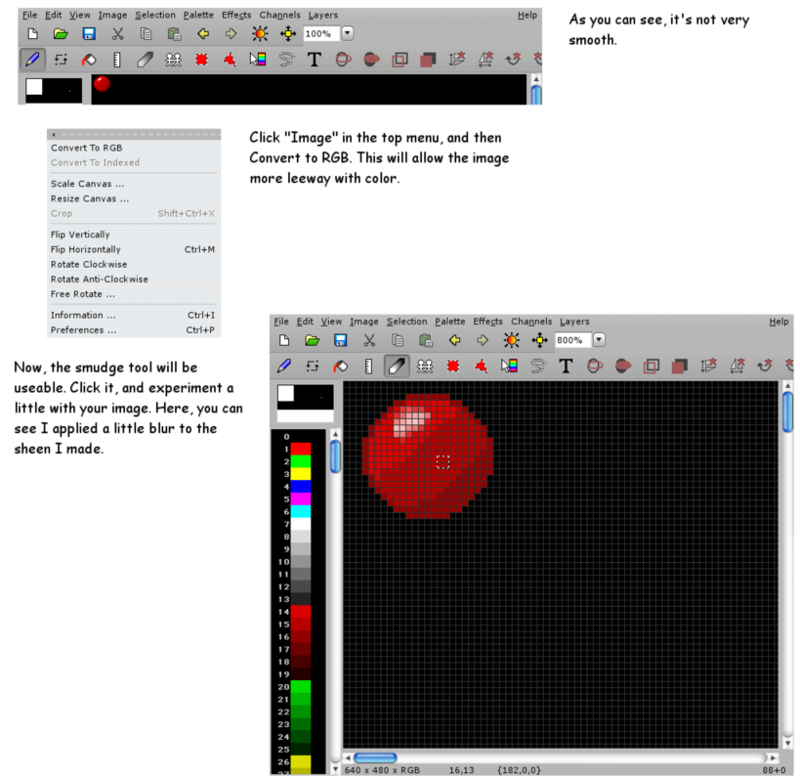 Mark had an mtpaint-blog where he published eight, short 'how-to' guides. He has taken his programming skills and applied them to a different project --- mtCellEdit --- a spreadsheet program. He has also packaged other utilities that he devised in doing that project --- such as a set of GUI-building utilities he calls 'mtMintKit', for Mark Tyler Minimal Tool Kit. I hope that Groshev and others can keep 'mtpaint' available, through 2020 and beyond. There was a '3.40' version released circa 2012. Most of the images on this page are from version '3.31' or before. You can use the 'Find' option of your browser to find keywords on this page, such as 'cut' or 'paste' or 'brush' or 'select' or 'keyboard' or 'shortcut' or 'layer'. 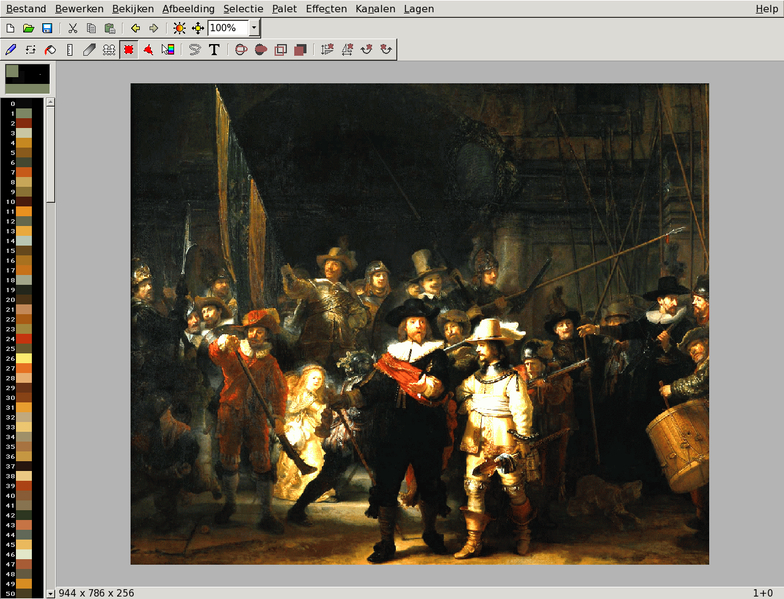 Copy/Cut-and-Paste of parts of images in 'mtPaint'. The 'secret': Use the 'Enter' and 'Esc' keys - to commit and finish. 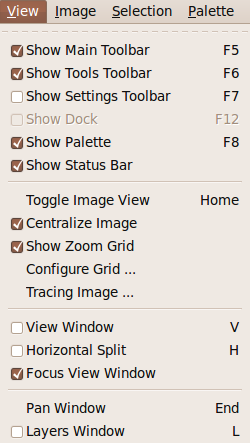 How to activate a grayed-out Blur option (and other grayed options) in 'mtPaint'. 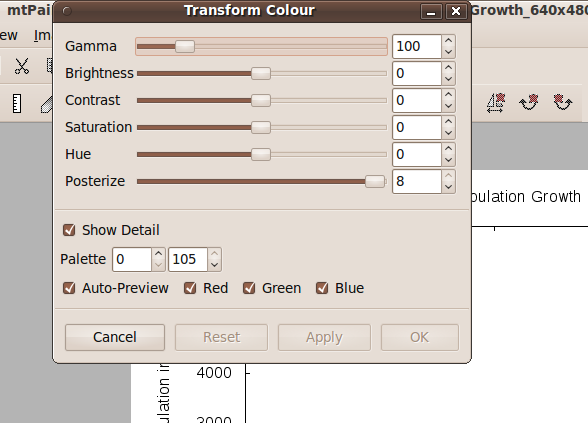 The 'secret': Switch from 'Indexed' to 'RGB' mode --- when editing a palette-based image, like a GIF file. 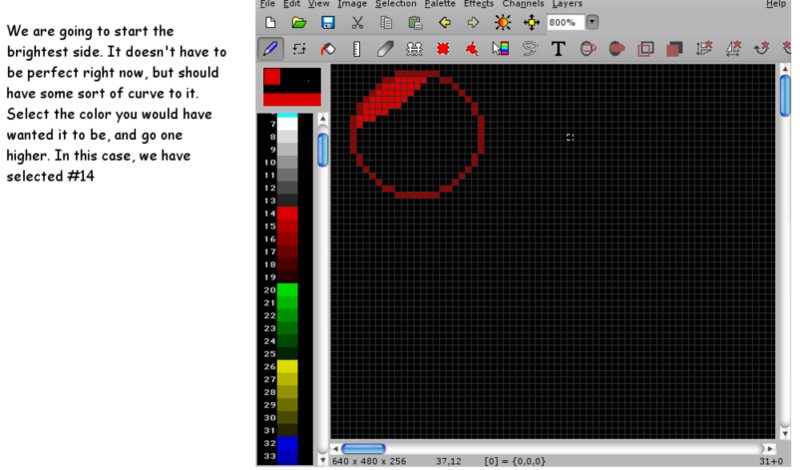 Pixel Editing an image in 'mtPaint'. The 'secret': Use the 800% zoom option. The content --- 'mtpaint' notes --- start below. 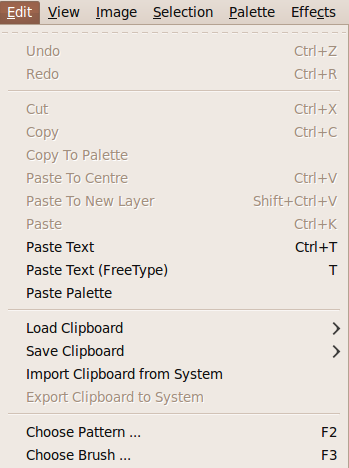 After dragging it where you want it, press 'Enter' (or right click) to 'commit the paste'. If you want, you can repeat the process, to paste one selection into several places. When done, press 'Esc', or switch to another tool. Alternately, you can enable the "Changing tool commits paste" preference on the "Interface" tab, to get a more MS Paint like behaviour. Some of the text above, on mtPaint Paste, was found in a forum page at murga-linux.com. I may add more complete info to explain the full steps of copy/cut-and-paste (including screenshots) at a later date. This information was enough to get me 'over the hump'. I trust it could help others as well. 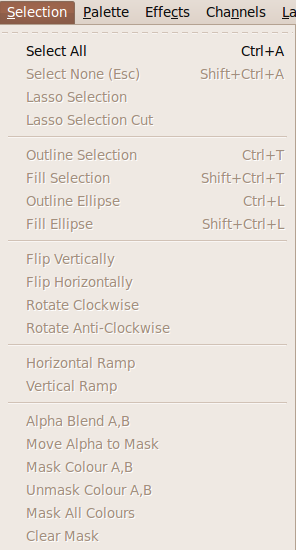 2015 Update: You can see the copy/cut/paste options in the Edit menu image below. 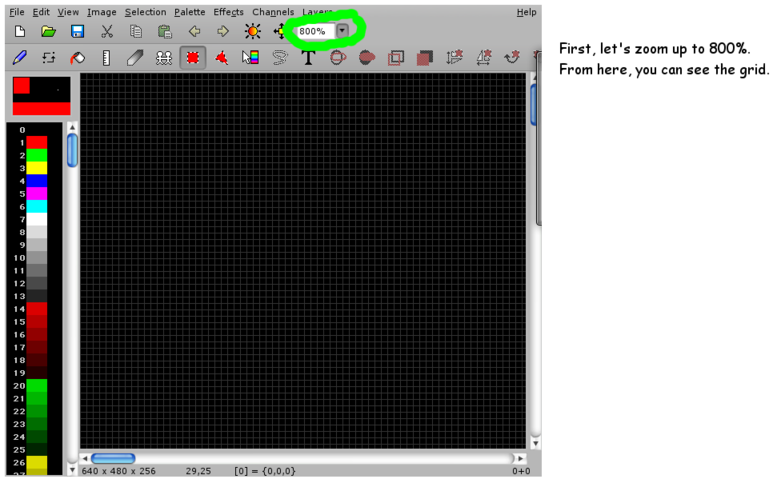 There are nine toolbar menu options across the top of the 'mtpaint' GUI --- File, Edit, View, Image, Selection, Palette, Effects, Channels, and Layers. 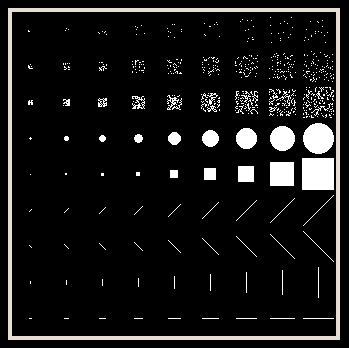 Effects - mostly for 'Transform Colour', to use 'Gamma correction'. 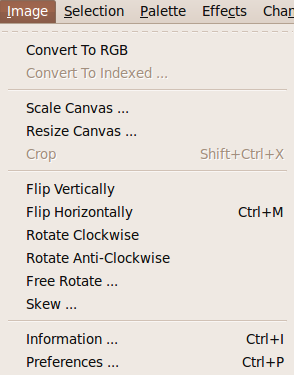 In other words, I hardly ever use the Selection, Palette, Channels, and Layers drop-down menus. If you are looking for information on those options, I do not have any guidance here --- but the images of those drop-down menus are below. This is the 'File' drop-down menu. This is the 'Edit' drop-down menu. Note the 'Choose Brush' option. 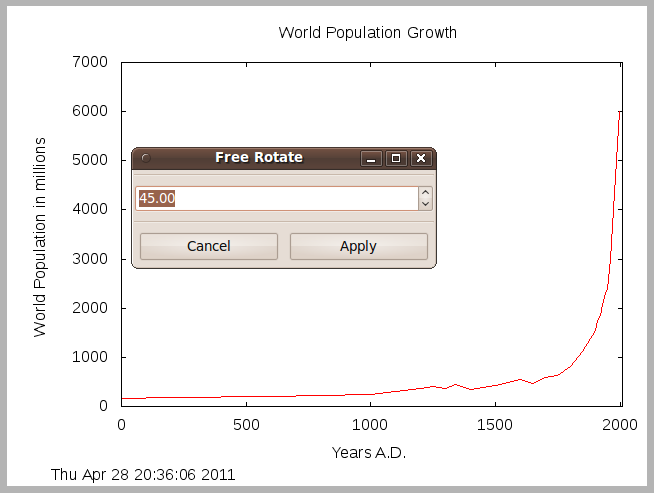 while clicking on the image with mouse-button-1. a 'brush' with which to apply the chosen color. 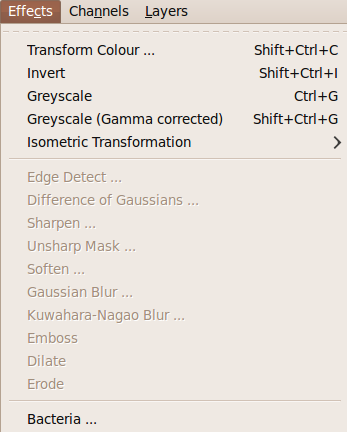 This is the mtpaint 'Brushes' menu. have the mouse cursor positioned. where a 'spray' or 'line' brush is useful. Click on a brush type to select the brush. 'dab' or 'stroke' with the brush. Here is the 'View' drop-down menu. the way they came 'out of the box'. Here is the 'Image' drop-down menu. This is my 'go to' menu. I use the 'Crop' option frequently. the image that you are editing. 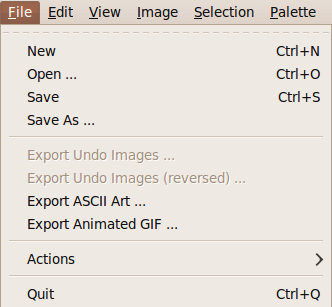 (for example, when editing a GIF file). you will see when editing a JPEG file. not restricted to a paletted ('indexed') image. and the camera was not level. or even a fraction of a degree. This is the 'Selection' drop-down menu. 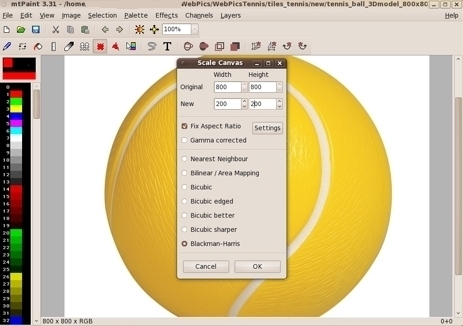 until a portion of the image is selected. 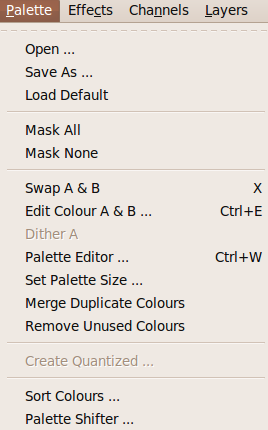 This is the 'Palette' drop-down menu. This is the 'Effects' drop-down menu. from the 'Effects' drop-down menu. to lighten or darken images. This is the 'Channels' drop-down menu. 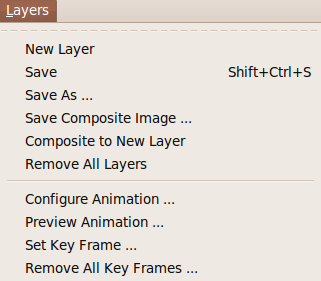 This is the 'Layers' drop-down menu. I have never really needed it anyway. to use it. Luckily, I am not an artist. 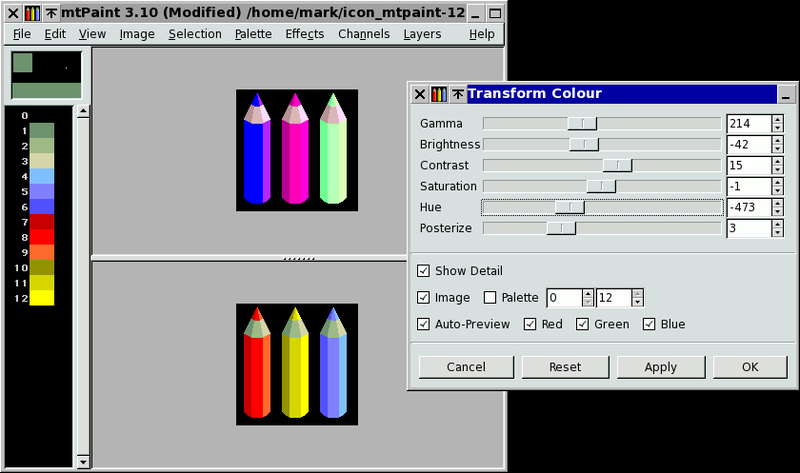 In the 'mtPaint' Image toolbar menu is the option 'Convert to RGB'. This will convert your image from a palette-based image (limited to 256 colors) to a 'true color' (16 million color limit) type of image. The Blur Effects (and about 8 other effects) in the Effects drop-down menu become active (not grayed out) when you switch your image to 'RGB'. This was a frustrating experience for me because, in several years of using 'Irfanview' on MS Windows, its blur option would work even if you were editing a palette-based file, like a GIF file with only a couple of colors in the palette. Apparently, underneath the covers, Irfanview would automatically make a conversion to a larger palette --- or to a 'true color' image type. 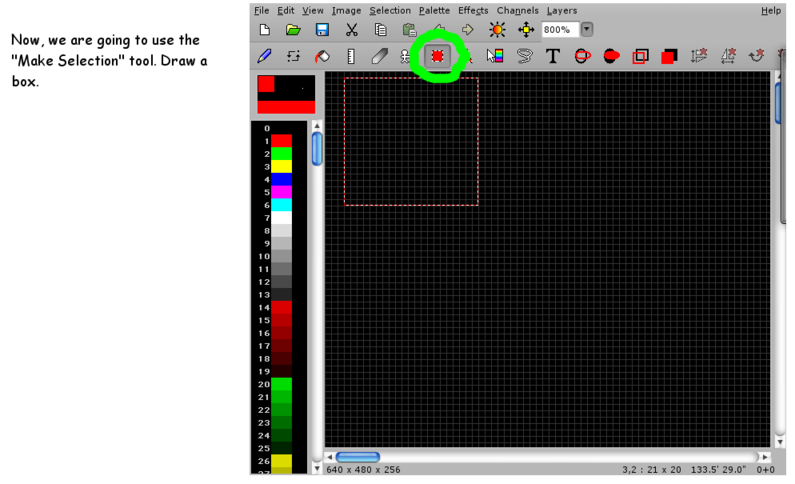 In contrast, the 'mtPaint' 'Save As ..' dialog window will NOT present a JPEG option in the 'File format' options button. However, I know a JPEG option is available because it is among the 'File format' options if I read in a JPEG file for editing. It indeed turns out that by using 'Convert to RGB', one will have the option of saving an originally palette-based file as a JPEG. 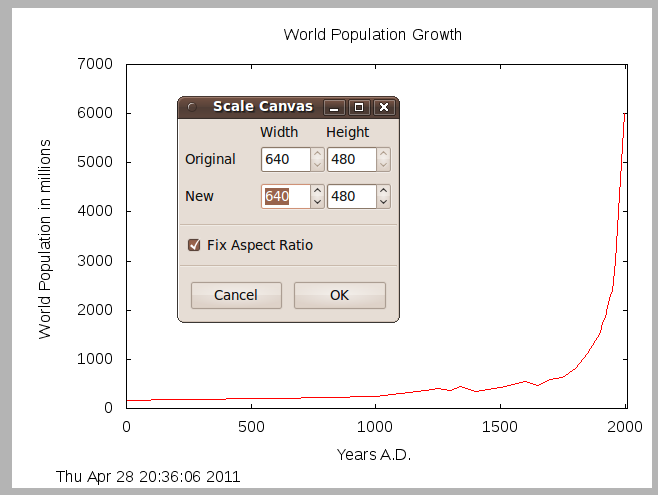 I find that you can edit down at the pixel level by using a toolbar option to zoom in 800 percent. Here is a tutorial using the 800% zoom and pixel editing. 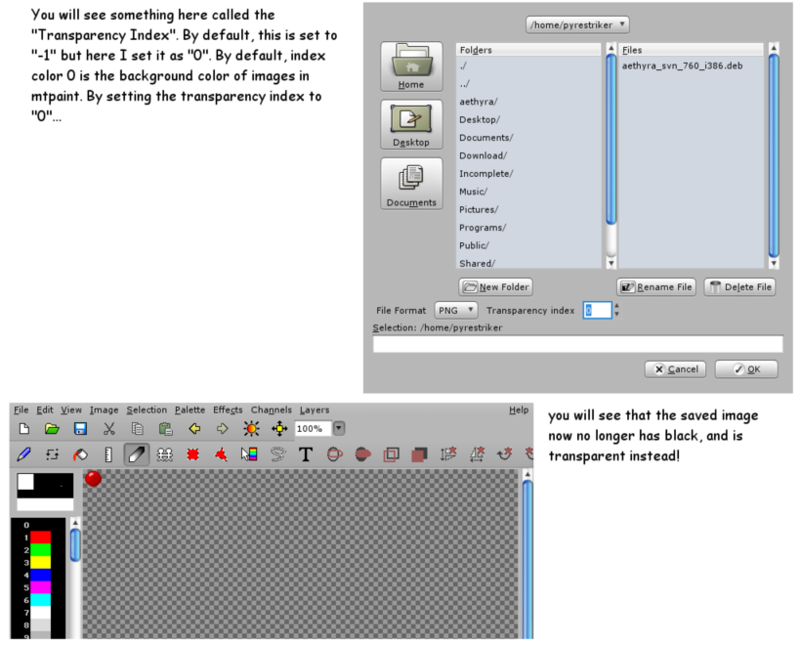 This tutorial was posted in a single, tall image --- by 'pyrestriker' at deviantart.net. I have broken the image up into 13 separate images and added a few notes. 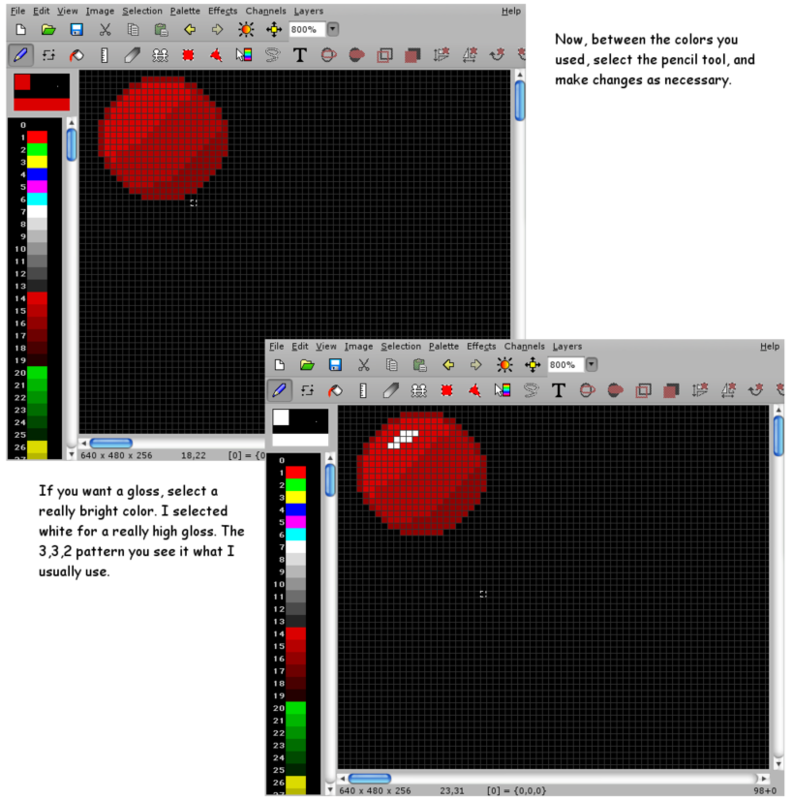 The goal of this tutorial is to make what looks like a little red ball --- that looks shaded and with a glint of light reflected off of it. 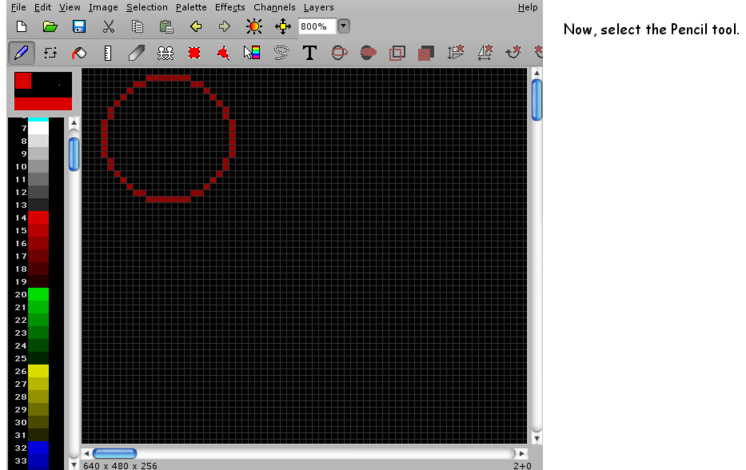 The ball is about 22 pixels by 22 pixels. like the one seen in the Mac OS. 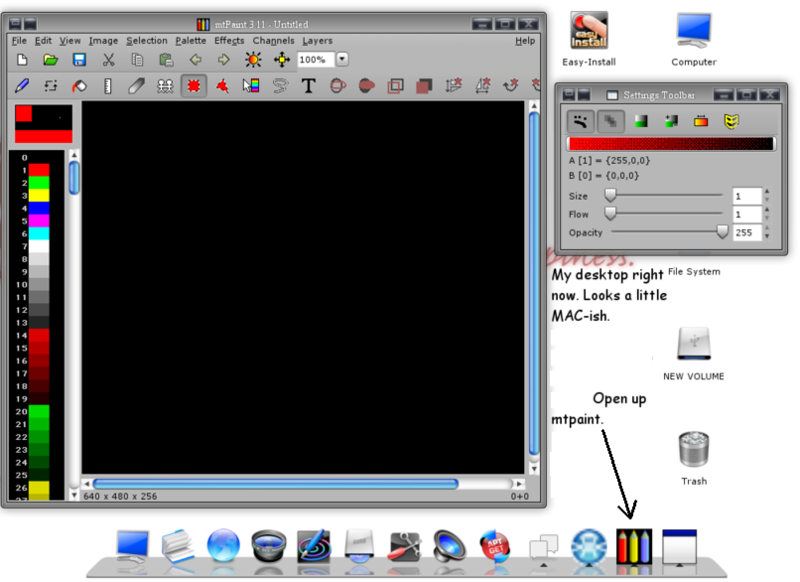 Note the icon for the mtpaint program. 100% when mtpaint starts up. red ball at the upper left of the 'canvas'? 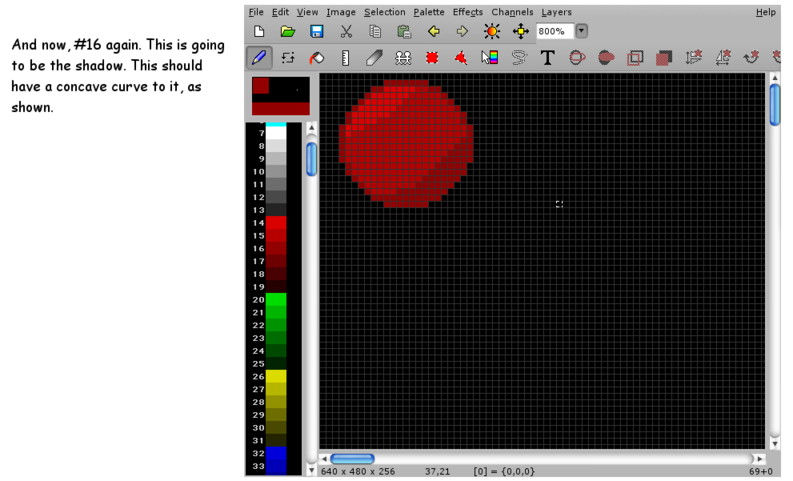 an mtPaint tutorial - on making a sphere-like image and doing shading and blending. An 'nl' (Netherlands language) screenshot. Note the nine menu names in the top menu bar. at the bottom-left in the status bar. Page was created 2010 May 14. Page was changed 2011 Feb 08. Page was changed 2015 Dec 07. Page was changed 2018 Dec 13.